Today, when you order "Infinity Wallet (w/DVD) by Peter Nardis", you'll instantly be emailed a Penguin Magic gift certificate. You can spend it on anything you like at Penguin, just like cash. Just complete your order as normal, and within seconds you'll get an email with your gift certificate. All of the above features are cleverly built into with a stylish, natural looking bill-fold wallet that fits neatly into your back pocket and has been designed and crafted from the ground up in quality black leather. A deck of cards are dealt face up on to the table by the spectator. They stop dealing at any point and you remove a single note from your wallet. Written on the back of the note is the name of the selected card!! Three notes/bills of different denominations are borrowed from 3 separate spectators. A forth spectator has a totally free choice of which note he/she chooses and you are able to reveal the serial number!!! This is a great effect you can perform in almost any setting!!! The possibilities of the Infinity Wallet are vast, making it an ideal "carry everywhere" tool that means you will always be prepared to mystify! If you are looking for an ordinary looking billfold with lots of space for billets, cards, MOs, and pocket effects, this is your ticket. I have many card to wallets and I must say that this is one of the best, the quality is amazing especially considering all of the inner workings. I absolutely love this wallet, this is a billfold style wallet that will do it all, switches, heirloom, KK, peek, and so much more, a book could be written about this wallet, it's unbelievable that this small wallet can do so much! I would have bought this wallet a long time ago if there were pictures of it available. It looks so good and should not have a picture of the box. I never leave home without this loaded with heirloom, powerball 60, extreme burn 2.0. Oh By the way so many things can be done impromptu with this, mentaliism, switch out for extreme burn or anything really. The DVD is very good and a lot of tricks are explained very well, I also own the F1 Nitro but this is a wallet that should never be left at home. Alakazam has not made a bad product in my opinion. Trust me, showing pictures of this wallet will only increase sales and will expose nothing. Do not hesitate, this wallet is near perfect and is worth more than advertised. Now! This wallet is very well made and allows you to perform a number of different effects. Highly reccomended! This has become my everyday wallet. 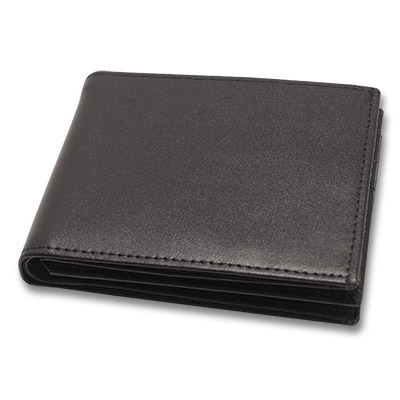 Works as a regular wallet fine without being too bulky and plenty of room to carry tricks in. Great peek, shogun, and outs . I carry heirloom in this and love it. I really love using the card to wallet function as a closer to my ambitious card routine. It completely kills everytime. Probably the best magic wallet I’ve used so far. I wanted this mostly for a card to wallet but it just doesnt work. The card and the S***e get stuck EVERYTIME when loading the card. This makes the card stick too far out of the pocket for comfort. Even if this was good enough for you, to take the card out for the reveal you have to "Unstick" it from its jam by pushing it out even further on the other side. Way too risky and visible. Can i return this thing?? I gave 2 stars because other than that, the rest of the quality is pretty good and the other features are great. without the gadget, a real genuine leather wallet cost only half as much. with the gadget, I can understand an extra $15 more. however, the trick on video that really caught my attentiom was the stop counting at any time. to perform this trick, you will have destroy no less than 4 new deck of cards and that will cost any one an extra $20 more no less.that is as far as the cost is concern. the peek section is not bad except the angle, you have to be very carefull or get get blown out of your seat. to sum it, I am not jumping off my feet and still in the market for a wallet that will deserve a 5 star rating from me. Can you recomend one? I really like the wallet and the DVD. But, It would have been really nice if the DVD came in a case instead of a plastic sleeve. In fact, it should come in one of those large DVD cases so the DVD and the wallet could fit neatly in a large DVD case for when it is not in use. Perhaps you could pass this tip along. 1 of 9 magicians found this helpful.